« Pig Squeak… Seriously, is that a plant or a sound? (Lenton Rose) This elegant Hellebore is part of the Winter Jewel™ Series and was created by one of the world’s top hybridizers Marietta O`Bryne. 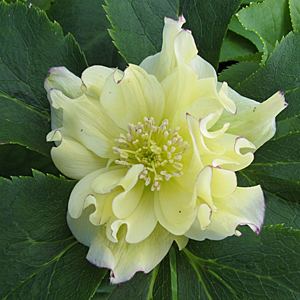 Helleborus ‘Golden Lotus’ has double golden-yellow lotus-like flowers. Some of the blooms will have red edges and red streaking on the backs as well. ‘Golden Lotus’ will flower in early spring and can be planted as a border, en mass, or in containers.